Control the bleeding by applying pressure to the wound with your hands for 3 minutes or with a bandage. Check the chest area. If the injury is near the chest it may indicate broken ribs, these can be very painful and may penetrate into the lungs. Apply a dressing if necessary. Is there an obvious fracture? If you find a bone poking through, do not delay your visit to the vet. If a bone is below the elbow or knees it is a good idea to temporarily splint or dress it. Use rolled up newspapers or cardboard as a splint (be careful not to get bitten). 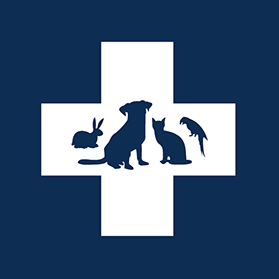 If there is an open wound, and you can't get to the vet immediately, apply a bandage to the wound area. Motor vehicle accident. Many small animals fracture their pelvis when they are in a motor vehicle accident - this can be extremely painful so take care when moving them. Try to use a sling to move the animal. Learn more about road accidents involving pets. Burn damage to the surface and/or deeper layers of the skin will occur immediately regardless of the source of burn. Visible signs can be seen immediately or it can take up to 12-24 hours after the accident depending on the cause or type of burn. Burns can be caused by a dry heat, such as flame, corrosive chemicals, radiation, electricity or cold. A scald is caused by a moist heat, such as hot oil, wax or water. This is an EMERGENCY. Transport your pet to a vet immediately. On the way check that the tongue is not causing the obstruction and if you can see an object which is causing the obstruction, try and remove it gently if possible. You can also attempt the Heimlich manoeuvre but follow these instructions with great caution and care. Eye injuries or problems should be considered emergencies. They can be extremely painful and if they are left untreated can quickly result in blindness. The most common causes of eye problems are trauma, corneal ulceration, eye prolapse and foreign bodies (such as grass seeds). Any redness, swelling, increased tear production, squinting, closing of the eye/s, cloudiness or blueness of the eye ball, discharge, change in the size of the eye ball, uneven pupil size, a membrane (third eye lid) has come across the eye, pawing or rubbing the eye are all signs of an eye problem. Eye injuries or problems should be seen by a vet immediately at the time they are noticed. Changes to the eye and its associated structures can occur quickly after an accident, even over a few hours. DO NOT put any medications in your pet's eye unless advised by your vet. If it is a penetrating wound to the chest, do not attempt to move the object, restrict your pet’s movement and if at all possible wrap the chest, covering the wound with a plastic wrap such as glad wrap, without putting any pressure on the impaled object. Resuscitation may consist of artificial respiration and/or cardiac massage. If your pet does not have a heart beat you should undertake cardiac massage. If your pet is not breathing but has a heart beat then perform artificial respiration. CPR (cardio-pulmonary resuscitation) is required if the animal is not breathing and does not have a heart beat. This involves a combination of massaging the heart and breathing for the animal (artificial respiration). If a pet stops breathing for 3-5 minutes there is a very poor chance of survival as brain damage is likely to have occurred. Click here for CPR (cardio-pulmonary resuscitation) instructions. Any break in the skin, such as an abrasion, cut, puncture or penetrating wound is susceptible to bacteria which can cause an infection. Damage to muscles, tendons and other vital structures of the body can also occur with deep wounds. Most wounds require a thorough flushing using sterile saline, removal of contaminating matter and devitalized (dead) tissue, surgical repair of the wound, specialised wound dressings depending on the type of wound and medication. This must be performed by a veterinarian. A graze affects the surface layer of the skin and doesn’t usually go through the full thickness of the skin. Depending on the cause it can be a large or small wound, it can be either fairly clean or contaminated with road gravel, dirt, fur and grass.